Group Therapy invites readers to reconsider their perceptions of mental health, by asking how far our personal wellbeing is related to the values of the society we live in. In the 21st century, where many of our daily activities are mediated by digital devices, it focuses particularly on the impact of new technologies on our sense of self and our collective wellbeing. Using provocations and personal testimonies, the book challenges conventional perceptions of mental illness, while offering practical advice on how to deal with contemporary problems such as internet addiction or mental health in the workplace. Written by artists, psychologists and health professionals, and building upon an exhibition at FACT, Group Therapy provides an accessible 'how to' guide for the contemporary day-to-day experience of mental health. Editor Biography: Vanessa Bartlett is a researcher, writer and curator currently based between London, Liverpool and Sydney, Australia. She is a PhD candidate at University of New South Wales, where her research explores digital art as a way of prompting audiences to reflect on their own mental health in the gallery space. Vanessa’s writing has featured in The Guardian and she has given lectures internationally in Belgrade, Ljubljana and Helsinki, as well as at prestigious UK venues like Tate Liverpool, The Arnolfini and The Science Museum, London. In the past she has worked as a researcher and producer for two of the UK’s most exciting digital media festivals: FutureEverything, Manchester and Abandon Normal Devices (part of the programme at FACT, Liverpool). She has also curated a number of successful exhibitions, including Slowness at Red Wire Gallery, which was highlighted as a must see exhibition by Times critic Rachel Campbell-Johnston. Vanessa’s research is motivated by her personal experience, which she first began to document April 2010 on a blog that was called Group Therapy. 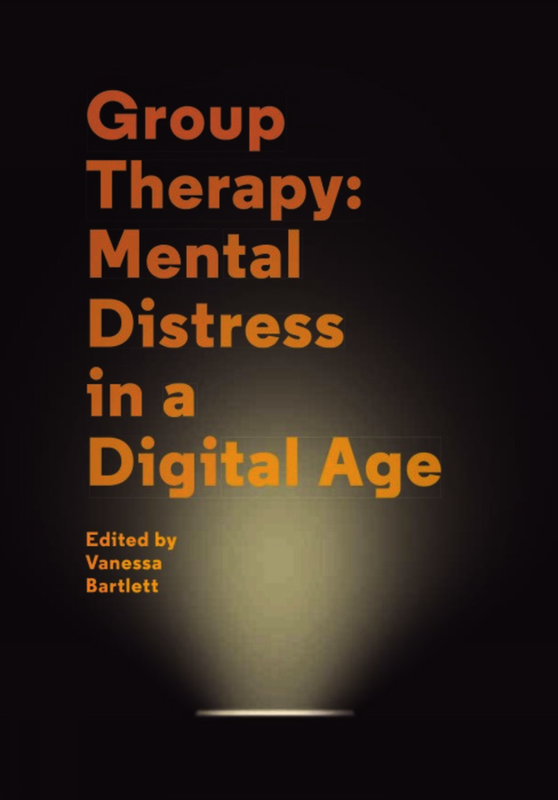 This blog explored the relationship between contemporary art, mental health and technology and laid the conceptual foundation for the Group Therapy exhibition. Vanessa is currently in the process of developing a project called What Can Art Do? that will serve as a platform for her ongoing work in art and mental health. www.vanessabartlett.com www.whatcanartdo.org Artists: Katriona Beales (UK) Dora García (Spain) George Khut (Australia) Melanie Manchot (UK) Lauren Moffatt (Australia / Germany) Jennifer Kanary Nikolov(a) (Netherlands) Kate Owens and Neeta Madahar (UK) Members of Freehand (FACT’s young people’s programme) Erica Scourti (UK / Greece) Superflex (Denmark) UBERMORGEN (Austria) the vacuum cleaner (UK) Quintan Ana Wikswo (US) Contributors: Victoria Betton Amanda Cachia Paul Dean Mark Fisher George Khut Peter Kinderman Benjamin Koslowski Seaneen Molloy Clive Parkinson Mike Stubbs the vacuum cleaner Charlotte Wealthy Artists Biographies: Katriona Beales Katriona Beales is a sculptor who also makes moving image, performance and installation. Her work responds to the slippage between offline and online worlds, internet addiction, the technological sublime and notions of a Digital Baroque. Beales’ completed her MA in Fine Art at Chelsea College of Art & Design in 2012. Selected awards: Stanley Picker Award for post-graduate study 2012-13 CCW Artists’ Moving Image Fund 2012 Residency at Tokyo Wondersite funded by the British Council and UAL 2012 Shortlisted for the Mark Tanner Sculpture Prize in 2014 Arts Council England Grants for the Arts Award as part of LUX13 Critical Forum 2014 Rhizome profile: www.rhizome.org/editorial/2012/oct/16/artist-profile-katriona-beales/ Website: www.katrionabeales.com Dora Garcia Spanish artist Dora García uses a range of media including performance, video, text and installation. Her practice investigates the conditions that shape the encounter between the artist, the artwork and the viewer, focusing more particularly on the notions of duration, access and readability. García’s pieces often involve staging unscripted scenarios that elicit doubt as to the fictional or spontaneous nature of a given situation, setting rules of engagement or using recording devices to frame both conscious and unconscious forms of spectator participation. García’s work also explores the political potential rooted in marginal positions, paying homage through several works to eccentric and often anti-heroic personas. Dora García has participated in dOCUMENTA13 (2012), Biennale di Venezia (2011), Biennial de São Paulo (2010), the Biennale of Sydney (2008), Skulptur Projekte Münster (2007), Istanbul Biennial (2003)... George Khut George Khut is an Australian artist, academic and interaction-designer working across the fields of electronic art, interaction design and health, at UNSW Australia, Art & Design. For the past 12 years he has been working with biofeedback technologies, creating intimate, body-focussed interactive artworks experiences, that re-frame experiences of embodiment and presence. In addition to presenting his work in galleries and museums, he has been developing new audiences for his work in exhibitions and research projects in hospitals, starting with The Heart Library Project at St. Vincent’s Public Hospital in 2009, and more recently with the BrightHearts research project with Dr Angie Morrow, Staff Specialist in Brain Injury at The Children’s Hospital at Westmead, Kids Rehab. Kate Owens & Neeta Madahar Kate Owens is a writer and artist exploring mental health, memory and memoir. She is collaborating with Neeta Madahar on ‘Me and the Black Dog’. Owens graduated from the University of Wales, Newport with a BA in Film and Photography (1994). She has exhibited internationally and won a Rhubarb Rhubarb bursary with her series 28 Day Flower Diary which was published in The Sunday Times and shown at galleries Flowers East and Unseen. Owens completed an MA in Creative and Life Writing at Goldsmiths University (2014) writing a fictionalised memoir. Her artists’ books are held in the Tate museum collection. Neeta Madahar is an artist, meditation and yoga teacher. Her art explores nature, artifice and the self. She is collaborating with Kate Owens on ‘Me and the Black Dog’. Madahar graduated from Winchester School of Art with a BA in Fine Art (1999) and from the School of the Museum of Fine Arts, Boston with an MFA in Studio Art (2003). She has exhibited widely including most recently, the Kemper Museum. Her work is held in the Santa Barbara Museum of Art and the Victoria and Albert Museum. In 2008, she was awarded a fellowship by the National Media Museum. Melanie Manchot Melanie Manchot is a London based artist who works with photography, ﬁlm and video as a performative and participatory practice. Her projects often explore specific sites, public spaces or particular communities in order to locate notions of individual and collective identities. Her work has been shown nationally and internationally including exhibitions at The Whitechapel Gallery, London; MacVal, Musee d’Art Contemporain, Paris; The Photographers Gallery, London; The Brooklyn Museum, New York; The Australian Museum of Photography, Sydney; The Courtauld Institute, London; Museum Folkwang, Essen and as part of Nuit Blanche, Paris. She is the recipient of many awards including the Oriel Davies Award 2012. Her video installation ‘Twelve’ will be presented as a solo national touring show from 2015-2016. Lauren Moffatt Lauren Moffatt (b. 1982) is an Australian artist working with immersive image making technologies. Following studies in art, cinema and media theory at the College of Fine Arts (Sydney), Paris VIII University and Le Fresnoy Studio National she has developed a body of work pivoting around stereoscopic photography and informed by the history of cinema and broadcast technologies. She is interested in how the dimension of depth in digital moving image can be used as a storytelling device. Her works, often presented in multiple forms, explore contemporary subjectivity and connected bodies as well as the limits between virtual and physical worlds. Jennifer Kanary Nikolov(a) The independent artist Jennifer Kanary Nikolov(a) studied fashion design from 1994 to 1998 before graduating with the first version of roomforthoughts from the fine arts department of the Maastricht Art Academy in 2000. She continued with a Tweede Fase programme (now the equivalent of a Masters) at the Sandberg Institute in Amsterdam, which she completed in 2002. Afterwards, she was invited to participate in the first experimental curating course initiated by the University of Amsterdam and the Sandberg Institute. Jennifer has curated and shown work in the context of various art and science projects, such as Battle of the Universities, Kloone4000 and Discovery07. From November 2007 to April 2008, she worked as an artist-in-residence at the National Psychiatry Museum in Haarlem, the Netherlands. Erica Scourti Erica Scourti was born in Athens, Greece and is now based in London. Working with text, video and performance, she draws on her own biography to explore digital identity as an entanglement of personal and collective experience. Her work has been shown recently at Hayward Gallery Project Space, The Photographers’ Gallery, Brighton Photo Biennial, Munich Kunstverein, Museum of Contemporary Art, Athens, IMPAKT festival and Banner Repeater and she has presented performances and talks at the ICA, the Irish Museum of Modern Art, DRAF and the Southbank Centre. In Spring 2015 she will be in residence at The White Building, London. Superflex SUPERFLEX is an artists' group founded in 1993 by Jakob Fenger, Rasmus Nielsen and Bjørnstjerne Christiansen. SUPERFLEX describe their projects as Tools. A tool is a model or proposal that can actively be used and further utilized and modified by the user. Ubermorgen UBERMORGEN (AT/CH/US) Doing strange things with software & hardware We live and work in VIENNA AUSTRIA exclusively Our influences are Rammstein, Samantha Fox, Guns N’ Roses & Duran Duran, Pfizer's Olanzapine & Hoffmann's LSD, Lindt's Dark Chocolate & Kentucky Fried Chicken's Coconut Shrimps Deluxe UBERMORGEN's Official Website is UBERMORGEN.COM and yes, you may use all the stuff from the website and from elsewhere without permission the vacuum cleaner the vacuum cleaner is an art and activism collective of one. Through site-specific performance, street-based intervention and film, the vacuum cleaner empowers his audience to address socio-political issues including consumerism and mental health discrimination. From one-man shows to large-scale participatory actions, his approach is variously subtle and extreme, but always candid, provocative and playful. His work has been exhibited throughout the UK, including commissions from Tate Modern, ICA and Nottingham Contemporary as well as for BBC4, Channel 4 and Arte. He regularly presents work internationally both on the streets and in art spaces. www.thevacuumcleaner.co.uk Hannah Hull is the vacuum cleaner’s Lead Producer and Collaborator for Madlove. She is a situation-specific artist, creating social sculpture and political interventions. Her work is often dialogue-based and temporal. Her practice invites people to articulate the spaces in between; to disclose new sites, histories and languages. She is interested in empowering individuals to creatively and critically intervene with their world. She delivers and consults on creative practice for social change. Her specialist interest is the use of a critical, contemporary art model for addicts, ex-offenders and the homeless. www.hannahhull.co.uk Quintan Ana Wikwo QUINTAN ANA WIKSWO is recognised for adventurous projects that integrate her original literature, visual art, and performance. After fifteen years as a human rights worker, she developed a fieldwork-based practice using forced labor manufactured government communications equipment at obscured sites of crimes against humanity. Her works appear internationally, including three solo exhibitions at museums in New York City and Berlin. Her book of texts and photographs, The Hope Of Floating Has Carried Us This Far, is forthcoming on CoffeeHouse in 2015. Her fellowships include National Endowment for the Arts, National Endowment for the Humanities, Creative Capital, Yaddo, and the Pollock Krasner Foundation. Vanessa Bartlett is a researcher, writer and curator and producer currently based between London, Liverpool and Sydney, Australia. She is a PhD candidate at University of New South Wales, where her research explores digital art as a way of prompting audiences to reflect on their own mental health in the gallery space.